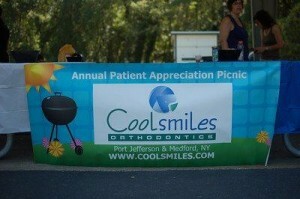 Coolsmiles Annual Patient Appreciation Picnic Everyone Is Invited! MEDFORD AND PORT JEFFERSON ORTHODONTISTS HOST THEIR 5TH ANNUAL PATIENT APPRECIATION PICNIC! Coolsmiles Orthodontics, leaders in providing spectacular Long Island smiles, invites all PRESENT and PAST braces and Invisalign patients! Feel free to bring friends and family as well. Expect nothing but FUN all day! BBQ..Softball..and sun. During our picnic we will also have a T-SHIRT CONTEST. Calling all picnic-going artists in the Coolsmiles Community. Your challenge should you choose to accept it is to get a T-Shirt and decorate it with Coolsmiles Orthodontics flair. Glitter, glam, graffiti, you name it! We will have a vote on the best T-shirt during the picnic. Winner receives an IPOD NANO! The only rule is you or a family member must be wearing the shirt to the picnic until we vote on the winner. We hope to see you all at the picnic!! You may sign up for the picnic at the front desk at either one of our offices, or feel free to call us and sign up as well! Don’t forget, you can bring your best friends too. They don’t even have to be our patients.